Lodges & Log Chalets - Complete Range of Quality Timber Log Chalets. Here at New Forest Log Cabins we pride ourselves on supplying a complete range of quality timber log chalets. We use the very best Estonian craftsmen to design and produce our log chalets and houses. Please CONTACT SALES department now for a complete design and build quotation. The Holiday Lodges at Hollybush Barn, Knapp Hill, Leigh upon Mendip, Near Frome, Somerset Beautifully designed and expertly hand-crafted with high quality fixtures and fittings. Two bedrooms, one with king size bed and the other bedroom with twin beds. A spacious open plan area with a well-equipped fitted dining kitchen and a comfortable lounge with wall mounted TV. The Lodges are available for renting for a weekend or longer, so you can try, before you buy. Beautifully designed for the ultimate 5* Holiday in Dorset. 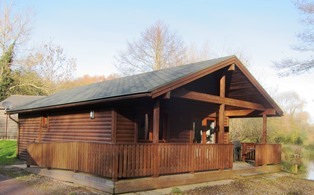 Two Holiday Lodges are now available for rent direct from the owner. With 2 large bedrooms, En-suite and Family Bathrooms, spacious open plan Lounge / Diner area with a very well equipped fitted kitchen and to top it off, you can relax under the stars in your own huge Hot Tub. Kingfisher Lodge is surprisingly much larger than the floor plan makes out and has a spacious Lounge / Diner with a large kitchen range suitable for holiday or year round living. 2 good sized bedrooms and a family bathroom will work very well for a family of four. The Watermeadow Lodges were designed for year round holiday accommodation and have 2 bedrooms a family bathroom and open plan lounge/diner. With it's small footprint it is surprising how much accommodation is included in this delightful lodge which is in the village of Nort Perrott, Somerset and available for renting for a weekend or longer, so you can try, before you buy..! Fancy a holdiday in a log cabin by the lakes or try one before you buy. Direct link to Watermeadows Lakes & Lodges. The Surrey is a log home with a difference. No only is it a luxury 2 bed, 2 bathroom lodge suitable for year round living or holiday accommodation, but it can be constructed as a static or mobile home. I have stayed in this log cabin and can vouch for the fact that it lives up to all you would expect from the moment you step foot onto the patio and when you take a look at the kitchen, it has a U shape design with plenty of space for the family and friends. Log chalets feature low profile roofs and can be fitted with steel profiled roofs and shutters for when not in use and include extensive veranda areas for hot tubs or patio furniture with an unmistakable character and charm of our quality log cabins. This very comfortable one bed lodge measuring 14.1mtr x 5.8mtr in 150mm oval log. Square and Laminated logs available in various sizes to suit you needs. New Forest Log Cabins presents the Sussex Log Chalet, a fully insulated log cabin that can conform to mobile specifications or park home with full building regulations making it a very flexible, versatile product for any building i.e. Living accommodation, café's, toilet blocks, reception area's etc. There are 5 different versions of the Log Konecta Home Chalet. Please CONTACT US or call our Sales Office on 01202 868844 for more information. New Forest Log Cabins have designed a new building that comes flat packed, delivered to your door and consists of a base, floor, roof and insulated wall panels that Konect and make installation simple, cutting fitting time by up to 50%. The 92mm massive log makes an airtight, soundproof energy efficient Mobile Log Home for year round living and the 3 double bed Copas Farm Managers Lodge has some special features like the kids live at the other end of the building and it has a boot / utility room which make for a more comfortable life for the busy family with lots of comings and goings. All glass window units used in windows and doors are double-glazed, argon gas filled for complete warmth and quality. The mobile log homes meet the requirements of the Caravan Act and can be built onto a wheeled trailer or wooden chassis for use at a later date if the home needs to be moved. Log Cabins of this size are constructed to meet the requirements for a temporary log structure and planning is normally approved under Permitted Development which takes 6 to 8 weeks to get from your local planning department. New Forest Log Cabins presents the Konecta Home, a fully insulated log cabin that can conform to mobile specifications or park home with full building regulations making it a very flexible, versatile product for any building i.e. Living accommodation, café's, toilet blocks, reception area's etc. New Forest Log Cabins have designed a new building that comes flat packed, delivered to your door and consists of a base, floor, roof and insulated wall panels that Konect and make installation simple, cutting fitting time by up to 50%. A Log Chalet needn't be just a room at the end of the garden to live in, it can also be a way of life with flexibility to double up as a weekend retreat for staying guests, or the comfort of an office with separate lounge, WC and shower room. We offer a complete custom made design service and supply elevation drawing and floor plans to assist with planning permission if required. 8mtr x 4mtr in solid 70mm logs. The Mardi 50 comes with a pedigree all of it's own. As soon as you walk through the door, there is a feeling of space, comfort and that indescribable feeling that you just want to spend time doing all those things that you just don't seem to get around to at any other time. 1 Bed Log Chalet 6 x 4mtr with overhang and verandah - 92mm. Built to meet full UK Building Regulations as a bed sit home with WC / Shower, Wash Hand Basin the Austin Garden Lodge would be ideal for the children when they return from University, Granny Annex or weekend Guest Chalet. 6 x 5mtr plus overhang and verandah with double glazed windows and doors, insulated walls, roof and floor in 70mm solid log. Built to meet full UK Building Regulations as a 1 bed home with full size Bathroom, Lounge and Dining Area. The open plan kitchen area provides for sufficient space to be close to the cooker and sink to create a light and spacious setting which combined with the vaulted ceilings make this design one of the most practical and flexible chalets constructed to meet full UK Building Regulations for year round living making it ideal as a Holiday Let or Grand persons Annex. 6.2 x 8.31mtr plus overhang and verandah with double glazed windows and doors, insulated, roof and floor in 150mm round log. Also available in 88mm Laminated and 92mm Logs. Large Double Garage with 1 Bed Log Chalet with WC above. Available in round and square log sizes. Constructed to meet full Building Regulations. 8mtr x 6.50mtr 150mm round log. Designed with the holiday accommodation market in mind, this compact, but flexible Log Chalet could be used as a Granny Annex, Student Lodge or your Log Home at the bottom of the garden. 2 Bed Log Chalet 9.15mtr x 6.0mtr including overhang and verandah 92mm wall logs contructed as a static lodge or Mobile Home. Built on a farm in Derby with it's own wood burning stove, this log chalet is cosy and confortable when it's cold outside. 2 Bed compact Log Chalet 9.5mtr x 6mtr 70mm with full insulation.